With this instrument, a reliable, waterproof logger is at your disposal. Thanks to its high quality processing, our waterproof Logger Water Temp Pro v2 withstands an ambient pressure in 120 meters water depth. Our waterproof Logger Water Temp Pro v2 is resistant to UV radiation and due to its streamlined design it can be used easily in flowing waters. Moreover, the waterproof Logger convinces with a accuracy of up to 0,2 °C. The entire measurement range from -40 °C … 50 °C (water) and -40 °C … 70 °C (air) can be resolved with an accuracy of up to 0,02 °C. Our waterproof Logger Water Temp Pro v2 hast got a large storage capacity and enables an acquisition of 42000 measurement results. The measurement intervals can be adjusted according to the demand on periods of time from 1 sec … 18 hours. 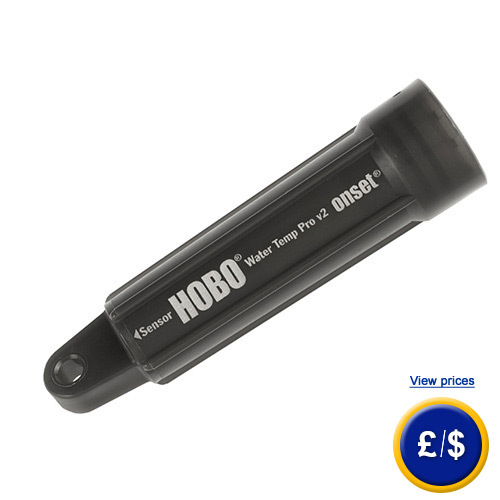 Ideally, the waterproof Logger has got a battery life of approximately 6 years. As the battery life is influenced by the environment temperature and the recording intervals, the expected useful life varies until the first battery replacement, which has to be factory- provided. The waterproof Logger disposes of an optical USB interface which allows a quick readout of the measured data by means of an adapter to the base station or the shuttle. A computer software package allows data analysis and documentation of the measured data recorded by the waterproof Logger. For further information about the Waterproof Logger Water Temp Pro v2, please read the following technical data or call our Hotline: UK customers +44(0) 23 809 870 30 / US customers +1-410-387-7703. Our engineers and technicians will gladly advise you concerning the waterproof Logger Water Temp Pro v2 and all the other products in the field of regulation and control or scales and balances of PCE Instruments. Note: Software and a readout unit are absolutely necessary for the operation of the Waterproof Logger Water Temp Pro V2! with the splash water- proof base station is the connection between the waterproof Logger Water Temp Pro v2 and a computer built. The data on the waterproof Logger Water temp Pro v2 are transmitted by infrared radiation via an optical interface to the base station. From there the data are transferred by an USB interface to the Computer. For the data link from the base station to the waterproof Logger Water Temp Pro v2, an adapter is necessary. This allows the data transmission system allows to readout the data of the waterproof Logger Water Temp Pro v2 in a matter of seconds. The Base-U-4 needs the software BHW-LITE or BHW-Pro-CD. 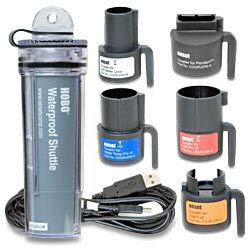 The Shuttle has a memory capacity of 4 MB and it can readout several waterproof Logger Water Temp Pro v2 and save their data records without being linked to a computer directly. 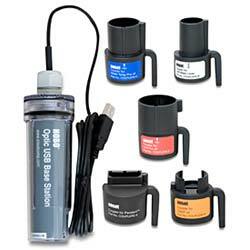 In contrast to the base station, the Shuttle is waterproof up to a water depth of 20 meters. The data transfer between a waterproof Logger Water Temp pro v2 and Shuttle is like a base station via an optical USB interface. The software BHW-Pro-CD is absolutely necessary for Shuttle U-DTW-1.